I believe we’ve just turned the corner here in Nashville. It seems like we are finally making our way into the cooler temperature of fall. I’m so thankful I live in a place that has distinct seasons. I always get excited when the seasons begin to change, and I start to see different produce in my CSA box. Oh how I’ve missed you butternut squash, dark leafy greens, pumpkin, beets, brussels sprouts, and carrots! One of the things I received in my CSA box this week was a butternut squash, and I decided on trying it roasted in a frittata. 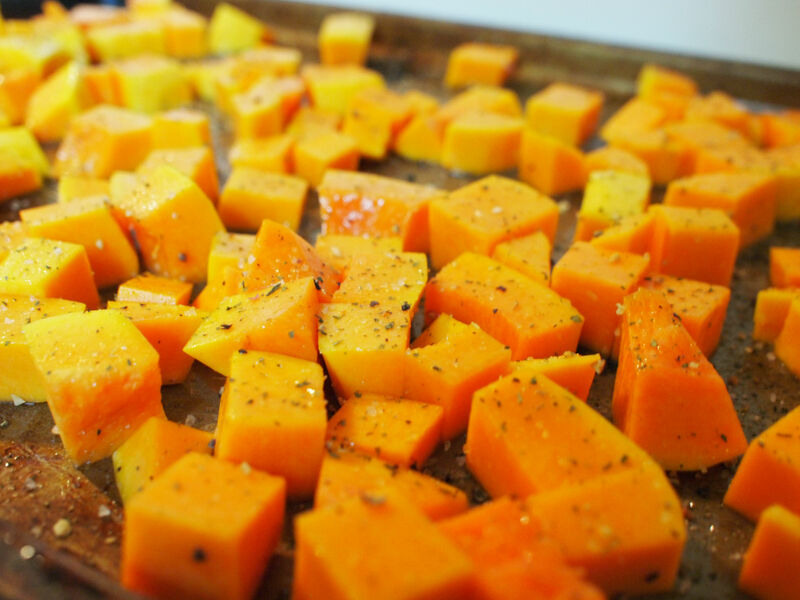 Did you know butternut squash is actually a fruit, rather than a vegetable because it contains seeds? It’s really a powerhouse of a fruit! It’s full of vitamins A and C, which are helpful in maintaining good vision and a healthy immune system, and boasts loads of antioxidants, specifically carotenoids (think orange and yellow fruits), which can prevent cancer and heart disease. This squash also contains 15% of your daily value of folate, which pregnant women need for healthy fetal brain development. The seeds, which are a good source of iron, can be washed and lightly roasted for a delicious snack. A frittata is very versatile, and a great way to enjoy vegetables from your farmer’s market or CSA, especially ones you aren’t sure what to do with. I will admit I’ve never had mustard greens, let alone cooked with them. So, for me this was a good introduction. Slightly spicier than kale, the mustard greens added a nice kick, nuzzled up against warming butternut squash, and complimented with the sweet, rich flavor of caramelized onions, this frittata is a great way to celebrate fall produce! 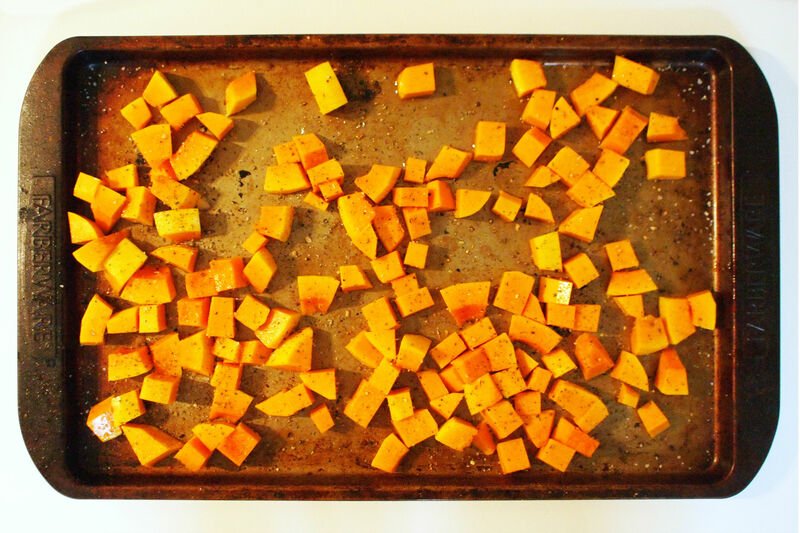 Begin by tossing cubed butternut squash in oil and sprinkle with salt and pepper. Roast in a 400°F oven for about 30 minutes, or until golden and just tender, tossing half way through. 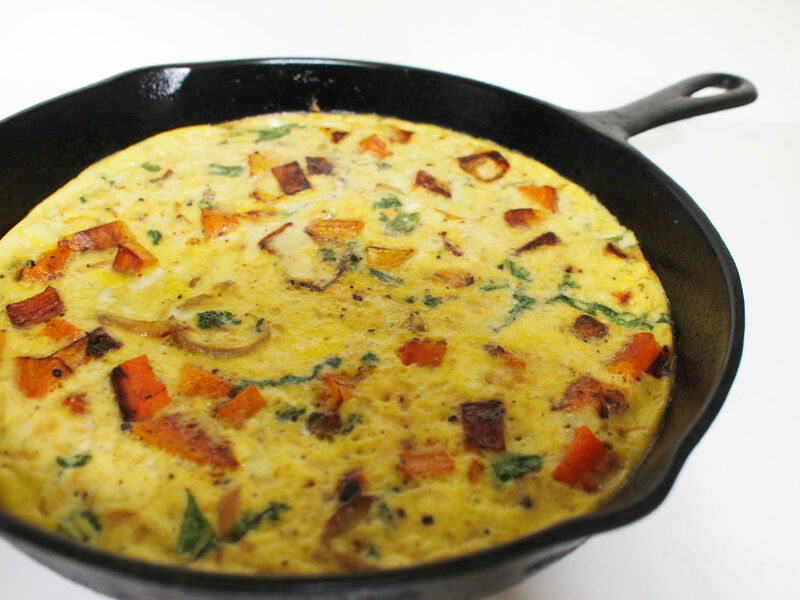 Set aside 1 cup of roasted squash for the frittata, and save the rest for another meal. Meanwhile, in a small bowl whisk eggs, dijon mustard, milk, salt and pepper. Once the onions are caramelized, add the mustard greens to the skillet and saute just until wilted. Next, add 1 cup of butternut squash and toss well. Pour in the egg mixture and let cook on medium-low until almost set. Finish under the broiler until eggs are set and the top is slightly crisp. Let cool for 5 minutes, then slice into wedges and serve. Disclaimer: The material on this blog is based on my own education, research, and personal experience and is not intended as medical or nutritional advice. Readers are encouraged to conduct their own further research. This entry was posted in breakfast, dinner, eat your vitamins, food, lunch and tagged antioxidants, breakfast, butternut squash, cast iron skillet, dinner, fall, folate, pregnancy, seasonal, vegetarian, vitamin a, vitamin c on October 11, 2013 by Ashley Couse. me too! fall is my favorite season! i made something with pumpkin today, as well. i can’t wait to see your pie recipe! Isn’t it so fun to eat with the seasons? Supermarket convenience is nothing in comparison 🙂 I can’t wait for my first mouthful of butternut squash this fall. 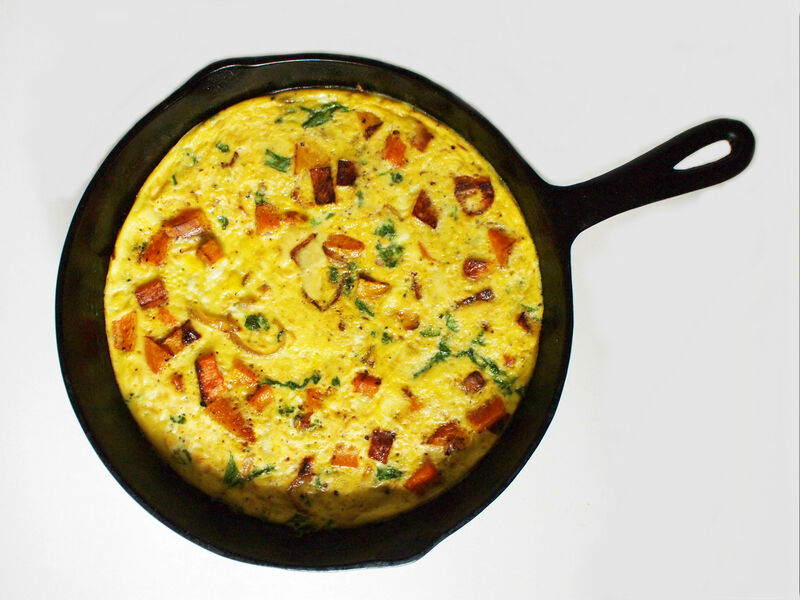 Lovely recipe—I bet the sweetness of the squash and onions really make the frittata wonderful.